The adult courses module is used to create and manage the listing of any adult courses offered. Adult courses can be found under Education > Adult Courses. To add a new Adult Course, click the green "+ Create Course’ button at the top of the page. Below is an explanation of the fields on the Adult Course page. If no categories have been set up this field will not appear. The categories are used to separate different courses for example by departments. When adding a new adult course select the category the course belongs to. The title for the adult course. This image is the image that appears at the top of the course information page. Ideally it is an image related to the content, having an image for content dramatically increases interest in that content. We recommend use of a landscape image. The content box is the main body of the course. 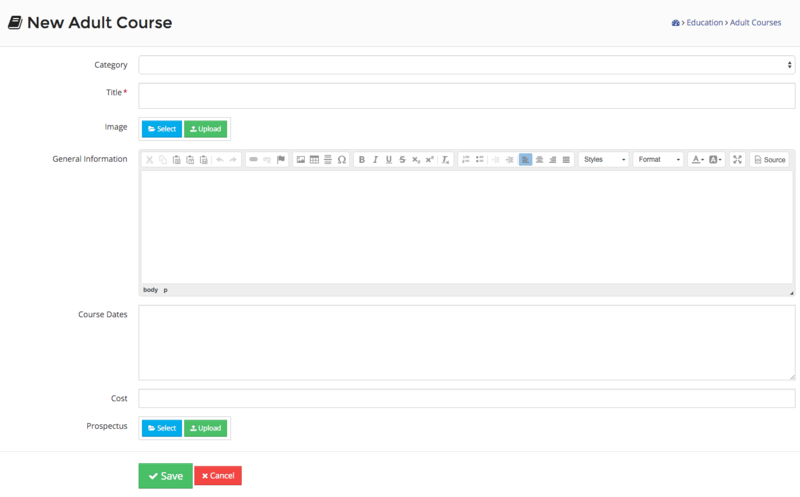 This is the same text editor present on most of the editable content pages in the Schudio CMS. The dates the course will be running. The option to include a prospectus for the course, which will appear on the course page in a button to download course information.